Whether you are decorating your house to sell, or planning on staying where you are, this before and after story will help you see the potential that waits in the next room. Studies have shown that renovating the main bathroom in a home has an estimated payback of 60% to 65% when the home is resold. But it can cost well over $5000 to complete, not to mention the significant inconvenience. Before calling a contractor, consider whether cosmetic changes will be enough to get the look you need for resale, or better yet, for you to enjoy until it’s time to sell. White walls, shag carpet with matching toilet seat cover, general clutter and wood shelf mirror and toilet roll holder, all made this bathroom seem old— despite the fact that it had been renovated. A weekend long $475 transformation. An insignificant investment in time and money, considering how important bathrooms are. Also worth the investment even if you were only decorating to sell because of the $475 in spending, only $195 went towards items that would be left behind if the house were sold! If you are selling your home, buy your new towels, mat and shower curtain before you move. You can use them to prop your house while it’s on the market and then enjoy them when you move to your new home. The old plastic towel bar was replaced with a brushed metal one with matching glass shelf over the sink and toilet roll holder. The white melamine cabinet was replaced by a shorter trolley (which could be painted to match). The top is used to display an art object and vase of dogwood branches or seasonal flowers, instead of general bathroom clutter which is now hidden in the baskets below. The medicine cabinet was painted to match the walls and the 1970’s vanity light (not shown) was replaced by a brushed metal halogen fixture. It provides more general light than the original fixture, matches the other new hardware and contributes greatly to the fresh modern feel of the “new” bathroom. 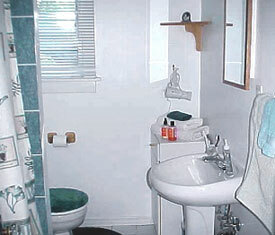 So, whether you are moving or not, why not consider how your bathroom can be enhanced with paint and accessories? You will appreciate it every morning and make it your refuge at the end of a long day. If this house were sold, all that would be left behind is the $195 spent on paint, light fixture and hardware. All the other items can be used in the next home! Considering how important bathrooms are to home buyers, this is a very insignificant investment. Before contacting your real estate agent, or even a house fluffer if you decide to use one, there are simple steps you can take on your own, like decluttering, to improve the overall look of your home. Be sure to approach the task with a highly critical eye. It can be hard to see your own home objectively after living in it for so long. Not Planning on Moving Any Time Soon? Then what are you waiting for? 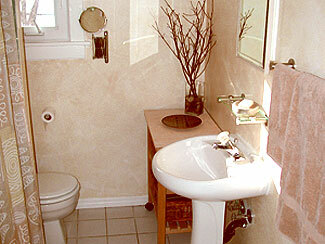 It’s time to freshen up that bathroom you’ve always hated with a whole new look. 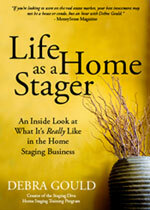 “It’s really sad to see how many of my clients suddenly realize they could have enjoyed living this way for years when I come in to stage, or decorate their homes to sell. Spend some money now so that at least you’ll get to enjoy the results before selling it to someone else,” says Debra Gould Toronto’s leading home stager, or house fluffer as she’s also called. Not in Toronto, and Need Help? 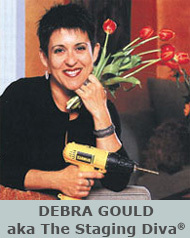 Through her Home Staging Coaching Service Debra Gould offers advice by phone and email to clients all over the US and Canada. “Virtual Staging,” as this is also called, is an excellent way to have your questions answered by a home staging pro as you need help. 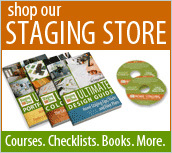 Learn more about how you can get home staging and decorating help by phone. 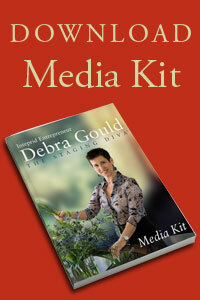 “The best offer my clients received during 2 months on the market was $350,000.